This panel discussion was organized on the topic ‘Towards COP24 and Beyond’, on 23rd November 2018 at The Constitution Club, New Delhi. This subject has acquired topicality in the context of the upcoming Conference of Parties to the UNFCCC and the special report released by the IPCC in the run up to the conference. It’s understandable now that together we need more determined approach towards reduction of CO2 emissions, in order to combat global warming. 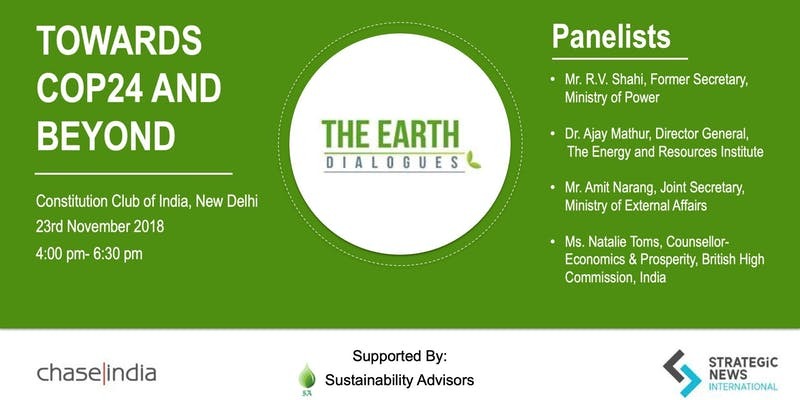 The discussion was part of the second edition of the “Earth Dialogue”, a platform that brings together experts from the field of environment, sustainability and climate change to highlight and discuss issues of utmost concern. The previous Earth Dialogue have featured – Mr. C.K. Mishra, Secretary, Ministry of Environment, Forests and Climate Change; Mr. Naveen Khandelwal, Chief Investment & Strategy Officer, Hero Future Energies; and Mr. Sudhir Mishra, noted Environment lawyer. Eminent experts from the government, academia and think tanks participated in the discussion. Thanks a lot to Chase India team for inviting me to this event in New Delhi.